Smith Drumlin Prairie is owned by The Prairie Enthusiasts, a grassroots conservation organization with chapters in Wisconsin, Minnesota and Illinois. TPE has worked to manage and restore Smith Drumlin for nearly 20 years, including regular burning, tree removal, mowing, and invasive species control. In the last couple of years, TPE began to seed the former agricultural field between the two drumlins back to prairie. The site is now home to eight species of prairie-dependent leafhopper insects, including Memnonia panzeri, a species of Greatest Conservation Need in Wisconsin. Smith Drumlin Prairie is a beautiful site to visit year-round, though perhaps a bit more so without snow. In the spring, puccoons and bird’s-foot violets put on beautiful displays. Moving into the warmer summer months, compass plant, rosinweed, rattlesnake master and prairie clovers show their colors. 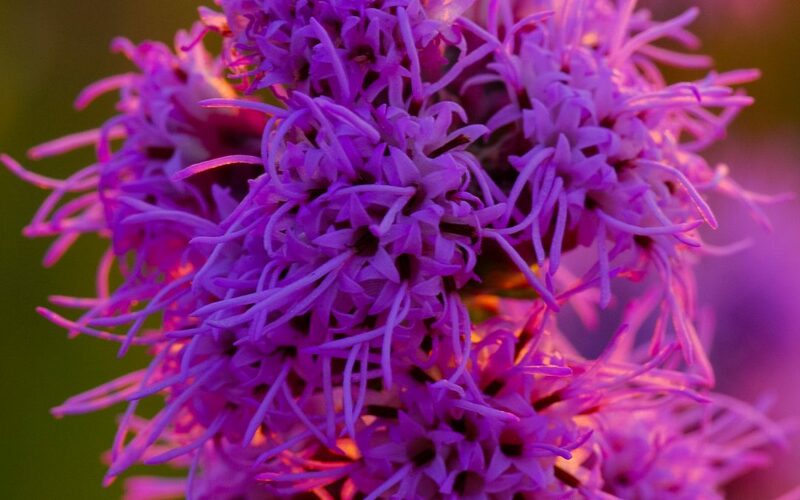 Beginning in late July, cylindrical or dwarf blazing stars bloom. These short, stout purple flowers are a harbinger of what is to come this time of year. A visit earlier during the year will find many tall flower stalks with seemingly unremarkable white flower buds. Soon, however, those buds will bloom in a resplendent display of purple petal power. The number of blooms depends on a variety of factors, such as if the prairie was burned earlier in the year, the weather, etc., but a visit to the site will surely not disappoint. View Josh Mayer’s additional images from Smith Drumlin here.